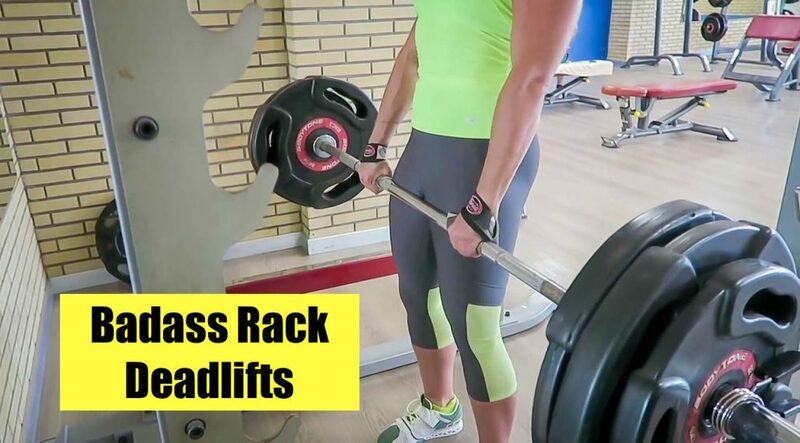 My latest workout Rack Deadlifts Harder Faster Stronger, involves just ONE exercise – The Rack Deadlift. I absolutely love deadlifts. There are many versions of the deadlift, Sumo, Jefferson, Hex Bar, Romania, Standard Deadlifts and Rack Deadlift. All deadlifts are excellent for strengthening the posterior chain, which is advantageous for performing lift and carry and wrestling. The posterior chain includes the, biceps femoris, gluteus maximus, erector spinae, trapezius, and the posterior deltoids. All of these muscle groups play an essential role in lifting movements. Most people think that when lifting something heavy, you need to bend at the knees, when in actual fact hinging at the hips with slight knee flexion is the correct position. This allows the muscles of the hamstrings to contract taking the load. This technique is referred to as the hip hinge. Once perfected, allows huge poundages to be lifted safely, eliminating the pressure from the lower back. This was my first time performing Rack Deadlifts in months. I felt strong and the rack was free, so what waste the opportunity of testing my strength. I maxed out at 120kg for 2 reps, I had been hoping for more since I had lifted 135kg using the Hex bar, I was therefore a little disappointed. Thankfully my new gym, Marinasenses in La Marina, Spain has everything I need. It is surprising how many gyms do not have a power cage or squat rack. These are in my opinion essential pieces of equipment every gym should have. I am very excited to be in the early stages of planning my first ever US tour, for hopefully around September/October time this year. New York, California and Las Vegas are all areas I want to visit. So, I want to be in the best condition I can be for you guys and of course summer here in Spain. Hitting the gym hard with a combination of strength training and conditioning work. More new tours are in the pipeline for Europe also, I am certainly a busy girl at the minute, maybe superwomen does exist- just kidding. I just want to say a thank you to all who have contacted me to book sessions, expressed interest, paid deposits, bought custom videos, donated or even dropped me a line to say you like my work! If you are not sure where I will be heading to next be sure to check out my tour page.